Once, I took a much-needed vacation with family and friends. I haven’t had a real one in years. Every part of me, inside and out, needed a break from schedules, routines, and the normal day-to-day. During this vacation, I was privileged to do and experience things I haven’t before. Two of the things especially of note were the zip lines and the quick jump. Both required jumping from the top of a high platform or rock wall and both really stretched me out of my comfort zone. Don’t get me wrong; zip lining was a blast, but in order to get down off the landing platform I was attached to a sort of supportive rope that would grab you and lower you gently as you made your descent. In order to activate the rope, the instructor told me to just step off. Watching others from the ground it didn’t seem that big of a deal but standing on the platform for yourself was a whole other story. It was higher than it appeared and I am not too fond of heights, to begin with. Standing there looking down the instructor repeated her directions: just step off or jump. Just step off or jump …??? With my eyes, I saw the rope catch and lower each person that used it. It never failed to do its job. But, my body had trouble taking that leap of faith. All I simply had to do was let go and depend on the equipment to do its job. A lot of times we face difficulties and challenges in life, things that stretch us way out of where we are used to being. Then, we are asked to trust God; to just step out and depend on Him as our unfailing equipment. Often our response is the same as mine standing atop that platform. The mind knows all the promises of God. The heart has digested His Word and has been filled with His Spirit, yet to just step out and let go . . .
It’s a lot harder than we first imagined. To let oneself freefall into trust where you have absolutely no control but to lean on Him takes courage. But, this is the kind of courage and trust that makes our heavenly Father’s heart swell. Knowing that our confidence is so strongly planted in Him, we just hold on and depend on Him to take us down from those high platforms of life – well, let’s just say, that’s all He ever asks from us is to lean and depend on Him. 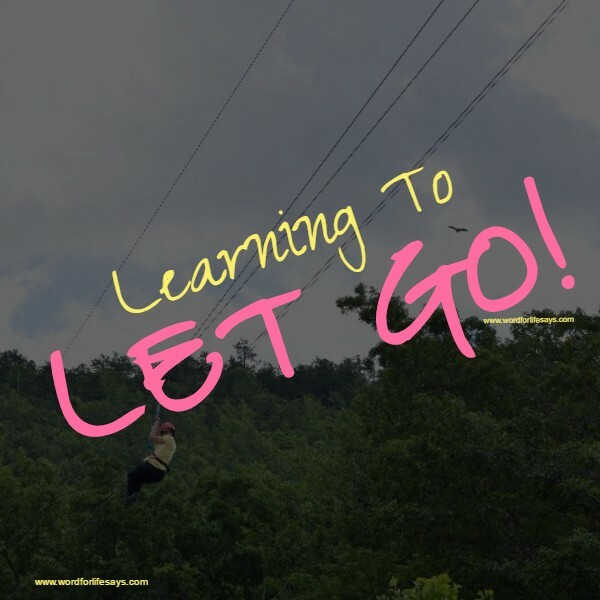 Every challenging story in the Bible and every hero in the great hall of faith (Hebrews 11), each one started with that one-step-of-faith moment; one learning-to-let-go experience, trusting wholly in God for the end results. Are you facing a challenge today? Are you being stretched beyond your comfort zone? Do you have goals that seem too big for you to accomplish by yourself? You don’t have to do it alone. Let go, and let God. See where the end results will be in Him. As far as those high platforms for the zip line and quick jump, I eventually sat down and scooted off. No flash or show. The rope was activated and did its job. The point is I did it, in my own way, and let go. Step off and let God’s power be activated in your life today.